One of the important branches of the post office is the delivery branch. We really care about mails. We have door-step delivery posts like registered letters, registered parcels, speed posts, ordinary mails etc. In the early system, we had Postman Module for dealing with all accountable articles, but now in CSI, it is replaced with DPMS branch. In this article, I’ll be explaining the procedures included in DPMS. In the old Postman Delivery Module, we dealt with registered letters, registered parcels, and Business parcels/express parcels separately. Similarly, we used SpeedNet module for dealing with speed articles. But, after migrating to CSI, it has introduced a new module called DPMS. In DPMS, we can deal all accountable articles on a single screen. In SAP, go to DOP main screen or type the T-code zdop_main. 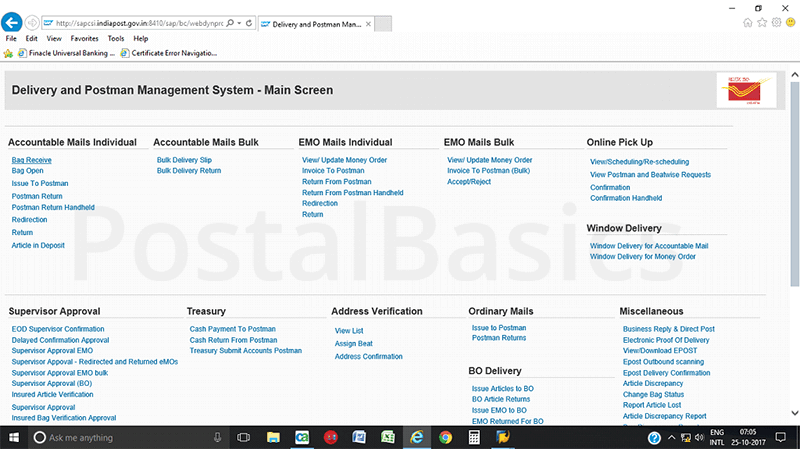 Click on the link Delivery and Postman Management System. A window will open in Internet Explorer as shown below. Accountable Mails Deals with all articles. Accountable Mails bulk Deals with bulk articles. EMO Mails Deals with EMOs. EMO Mails Bulk Deals with bulk money orders like temple related EMOs, STO EMOs etc. Window Delivery Deals with window articles. We will go through the above-mentioned options in detail. The articles contain only the important procedures of DPMS. Please suggest improvements by sending us an email.